I’m back in Canada where it is appropriately cold and windy and snowy and where I’ve been doing an excellent job of doing nothing. Well not actually nothing. I’ve reached Olympic-level eating and sleeping and up until now have also been managing some fairly high-level blog-ignoring. But cognisant of the fact that there's still a whole day of desert adventuring to tell you about, I’ve finally roused myself and ventured out into my natural habitat (a café with free wifi) to dust off the blog. When last we left our intrepid desert adventurers the sun had set on Day One and we were full of sweet tea and sheep brains and liberally coated in sand. 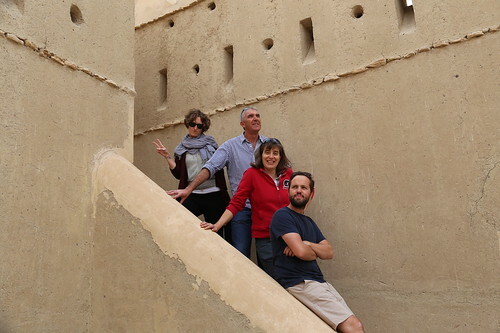 Having already ridden camels, visited a random castle, seen Abdulla’s farm, hugged baby goats and cavorted in the dunes, we were at a bit of a loss as to what there was left to do. How wrong we were. Naturally, we needed no encouragement whatsoever. So Abdulla made a phone call (he is the kind of guy who, I strongly suspect, either knows everyone interesting in the country, or at least knows someone who knows everyone) so we soon piled back into our cars to find the Camel Lady. Her camp was set up not far off and even though there were 13 of us, she welcomed us into her tent and made us sit down and served us coffee and dates and other delicacies. 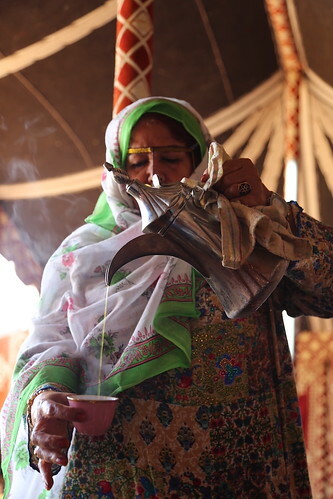 Here she is pouring us tiny cups of arabic coffee. 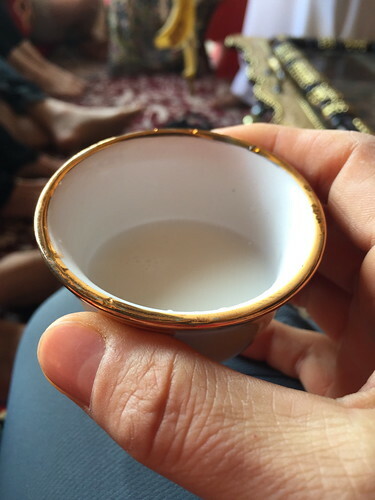 And here’s the warm camel milk I tried, which was not bad. It was awesome and also kind of surreal. How do you even process something like that? 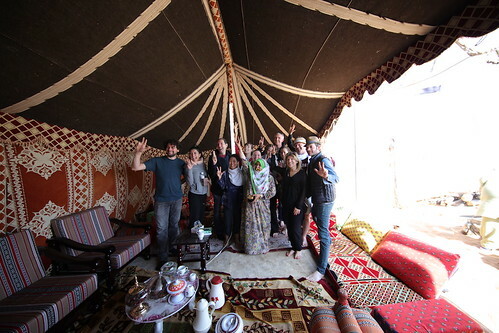 Hanging out in a tent in the desert in the company of the country’s only female camel baron(ess) drinking camel milk, with her dividing her time between taking calls on her gold iPhone, snapping photos of us and posting them to her Instagram account, proposing to kill a sheep to cook for our lunch, and dosing us with the scent of burning oud wood. 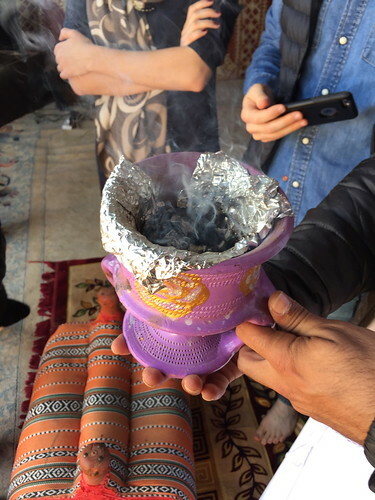 In this form oud is the burning charcoal of the agarwood, which is a dark, resinous heartwood from a tree that has been infected with a particular type of mould. The resin the tree produces in response to the infection makes the wood rare and very valuable and the oil from it is processed into perfume. And apparently it’s also burned as a sort of desert incense kind of thing. We were encouraged to allow the smoke to bath our faces. It was not exactly refreshing, but I suppose when you’re stuck in the desert it’s better than spending your whole life smelling like a camel. She really loves those camels. She kept feeding them big balls of mashed dates. Of course. We begged off lunch (thus hopefully sparing another poor sheep) and headed back to camp where Abdulla had already arranged a feast for us, including a local fish called hamour. It was served, like the sheep, on a huge bed of rice, and we ate with out hands again (at least those of us who weren’t pansy cowards). The hamour was delicious - a meaty white fish that must have been very large in life, considering the size of the bones. After lunch I think I managed to beg a half hour nap before we were off on another random adventure, courtesy of Abdulla. 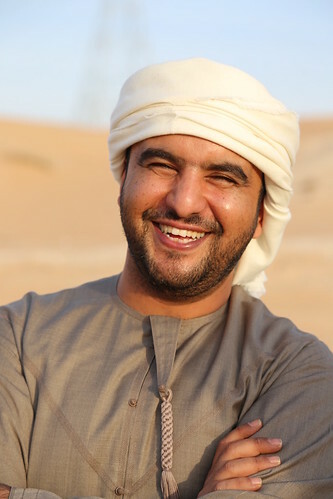 We decided we’d like another visit to some nice sand dunes, so we hit the road again and Abdulla led us to the top of a high ridge of sand where local crazy people drive UP in their fancy four wheel drive vehicles with their sand buttons on. Instead of doing that clearly insane thing, we instead decided to run down the dune. Of course. It was big. And surprisingly tiring to get to the bottom of. Luckily, Abdulla and Nick drove the long way ‘round to the bottom of the hill to pick us up. Because if you think running down a big sand dune is tiring, try crawling back UP. And then possibly the coolest random thing of the whole trip happened. We sat for a while at the top of the dune waiting for Nick and Abdulla to find their way to the bottom. (We are smart, and decided not to run to the bottom until our ride back also appeared at the bottom. 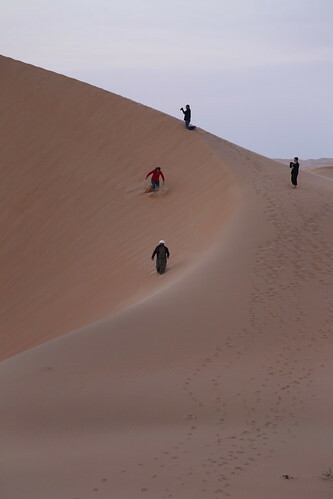 See aforementioned difficulty of climbing sand dunes.) And as we were sitting, we saw a group of men at the bottom of the valley training falcons! 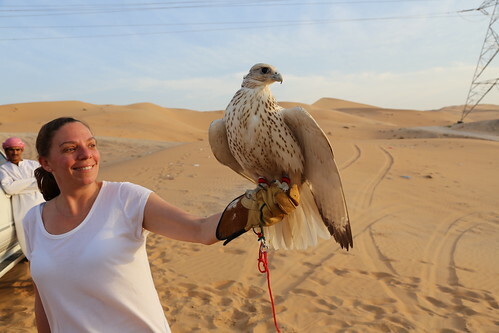 Falconry is a huge deal in the Emirates. Huge. 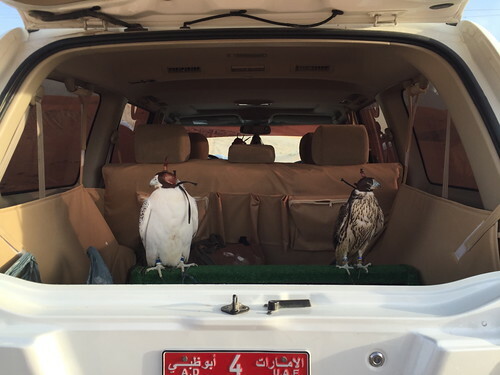 Owning, training and racing falcons is a very popular and traditional activity in the region, and we’d stumbled on a couple of regular guys, our with their birds. Once we were all down from the top of the dune (and because he’s awesome) Abdulla hopped out of the car and talked to the guys and soon we were all out looking at the birds and watching the guys and birds do their thing. I found this weird, but apparently they just transport the birds in the back of the car. I suppose it's like throwing your Irish Setter in the back of the station wagon to take him out for a run at the dog park. 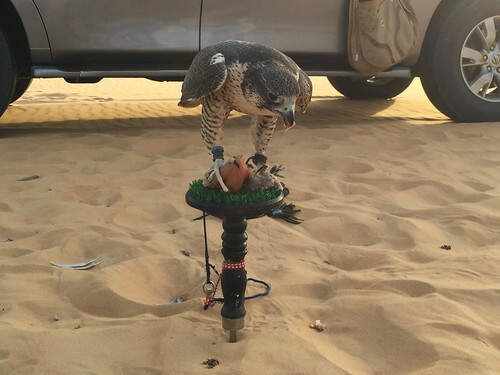 Traditionally, falcons are trained with a feathered lure on a long string. The trainer will swing the lure around and the bird’s job is to catch it in its claws while in flight. Our guys were doing that, but they were also employing a much more modern and cool method for higher altitude training… drones! They had two different drones, each equipped with a lure on a long string. The lure was hung from a clip that would pull away from the drone when the bird struck. There were, quite literally, feathers flying. And to top it all off, a few of us actually got to hold the falcons. At this point, we figured Abdulla was slightly magical, and would have followed him anywhere. In this case it meant that we followed him (in our Lost Boys car, piloted by the eminently trustworthy Nick) on a quick dune-bashing jaunt through the desert. Sources in Abdulla’s car report that most of his comments were along the lines of “There used to be a road here” and “I hope Nick is doing ok”. Most of the comments in our car were along the lines of “Oh my God!” and “Nick, no please don’t”. 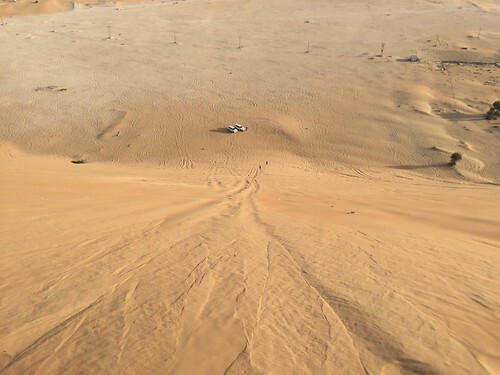 Happily, Nick has some experience in dune driving and was just fearless enough to make thing interesting but just sensible enough that we didn’t go nearly as high up the 45 degree slope as Abdulla did. And we all survived unscathed. And Nick got to have a bit of fun. And the sand button was well and truly used to full advantage. And yet the day was still not over! Off we went to find another picturesque set of dunes where we could watch the sunset and have one last romp in the sand. Me and Abdulla, racing along the inside slope of a dune. He outpaced me by a long way, even in his kandora, but I bet I could beat him on skates any way, any day. This was followed by a pitstop at the fancy hotel located near the camp. The hotel exists basically to serve people visiting the Al Dhafra Festival, though they’re trying to build a clientele outside the festival, though I suspect it’s a hard sell. It suited us fine though, and let us have a bit of a breather, and even a glass of wine, before heading back to camp for one last enormous supper. 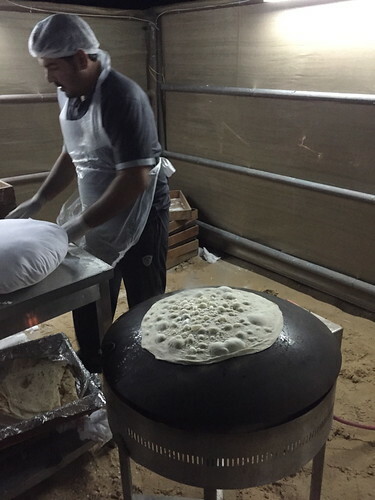 By this time, the construction of the camp was advanced enough to include a whole kitchen enclosure, so we had grilled meat and fresh flat bread cooked on site. Of course. We even got to go back to the kitchen and take the bread right off the grill, and have the grilled meat sliced onto the steaming bread in our hands. 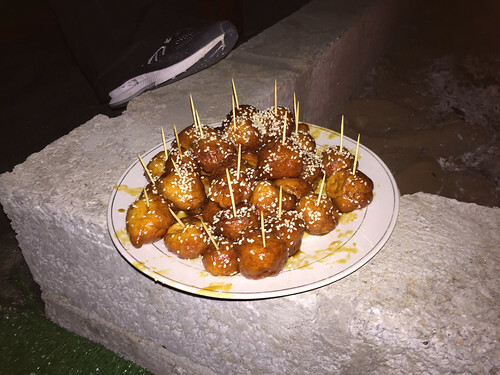 And of course then they made fried dough balls dipped in honey and sesame seeds. I stumbled off to bed some time later after another evening of sitting by the fire, chatting, drinking tea, and force-feeding myself fried dough. I think we talked about what an amazing experience the past two days had been, and how we needed share our photos, and how stupid everyone who HADN’T come on the trip was going to feel, and, of course how totally awesome Abdulla was. The next day we packed up relatively early and Nick got to give the sand button another workout on the way back to the highway, and we had a last few hours of each other’s company on the way back to the hotel where were arrived utterly exhausted, and smelling of campfires and camels. We then did that thing you do when you’ve had an amazing, intense experience with a group of people but no one can quite accept that it’s really over so you kind of hang around on the sidewalk for a bit before everyone finally drifts away with promises of drinks later. And then you shower eleven times in a row and have a very very very long nap and dream of camels. As I start to write this post I'm sitting in the Abu Dhabi Airport on a warm and sunny day, waiting for a flight to take me back to rainy London. The gig is done and suddenly it’s Christmas, which is exceedingly strange. It’s been summer since about May for me, so the idea that it’s Christmas in two weeks is simply bizarre. Though I’m sure I’ll feel differently when I get back to the Western World and get a few mince pies under my belt. 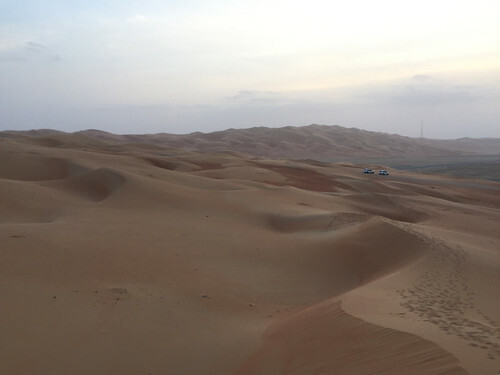 In the mean time, there's a lot to tell about my last two days in the UAE, which was spent on an amazing adventure in the desert, courtesy of a perfectly lovely local colleague and friend, Abdulla. 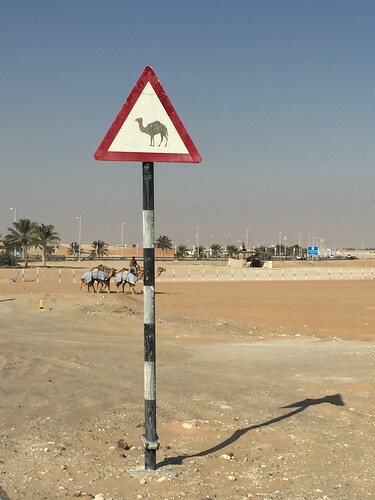 I’m not really sure how we came to be offered the opportunity, I only know that an email went around promising a trip out to the Al Dhafra Festival, popularly known as the Camel Beauty Pageant. 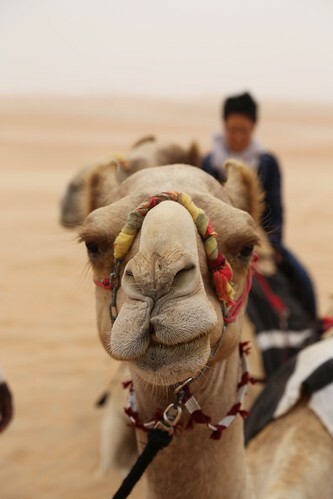 There would be camels (of course) and sand dunes, and camping in the desert… how could I resist? So it was that 13 of us gathered at the hotel on Monday morning and tried to shoehorn ourselves and our luggage into two big SUVs. Abdulla was at the wheel of one car, and it soon became apparent that the amount of luggage and people somewhat exceeded the amount of space available. That was when those of us in the second car sacked our local driver and elected one of our own as leader and driver (“Lost Boys Style!”, as Fritha commented.) With the car key recovered from the out-of-work driver who left with it in his pocket, and with our new leader, Nick, suitably schooled in the intricacies of the Sand Button, we set off. 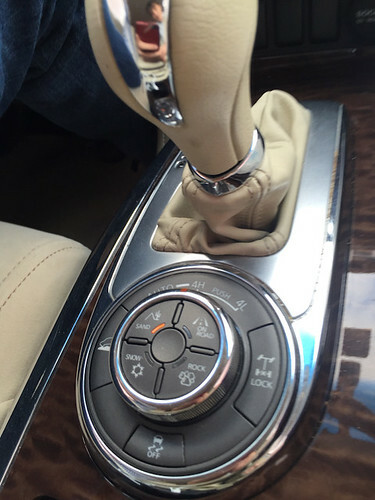 Of course the car came with a Sand Button! It would become important later on, as you will hear in our next installment. And when I say expensive, I am really not kidding. Prize money at the Al Dhafra Festival totals about 55 millions dirhams (about ten million pounds!) 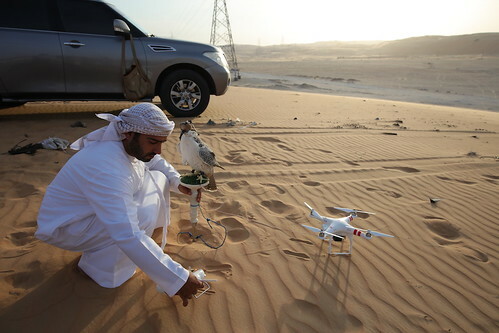 and a single specimen can easily be worth 200-300,000 AED (£36,000 - £54,000). Some breeders have a hundred or more beasts, and with each one worth more than a car, you can see how serious the business is. Driving towards Liwa, it was a bit odd how much it reminded me of home. The terrain is flat flat flat, and the sand drifting across the road looks remarkably like blowing snow. After a couple hours of driving and a few pitstops we made it to our desert camp at the Festival site. Our stay was from Dec. 7-9, but the festival didn’t start until the 10th, so the whole site was still very much under construction. Participants were still assembling their camps, each complete with camel pens and an uncountable number of UAE flags, and vendors were setting up stalls selling food and camping supplies. There was even a place where you could get your kandora cleaned (of course). Truly, it is the Glastonbury of Camels. Our site was inside a fenced compound that included a fire pit surrounded by wooden decking, a large traditional “majlis” tent, a dining tent, a couple of trailers with bathrooms, and a dozen smaller tents for sleeping in. The camp compound on the left, and on the right… desert. We were apparently about 30km from the border with Saudi Arabia, at the edge of what they call The Empty Quarter - the largest sand desert in the world. After we arrived we spent a bit of time just relaxing in the big tent, not really sure what was expected, or what would happen next. This became the theme of the trip - not being sure what would happen next. It required a sort of zen acceptance of whatever came, which generally turned out to be totally awesome. This is the part where we lay about on carpets in the big tent and drink sweet milky tea and tablespoon sized cups of Arabic coffee. And then the camels arrived! 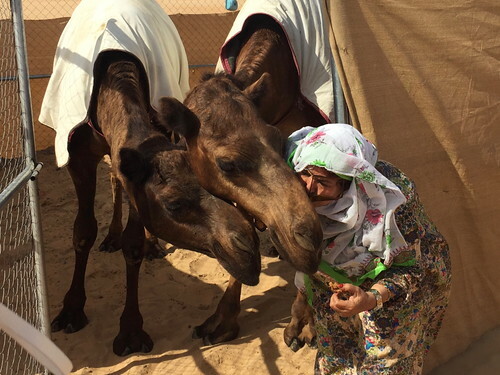 There were four at the camp, so we trooped off to just outside the fence where we all had a chance to ride the camels and get up close and personal. The trickiest bit of camel riding is getting on and off. The camel has to be sitting on the ground for you to get on and they have a quite lurchy method of getting to their feet that obviously works great if you’re a camel but can be quite disconcerting if you’re a person on top of a camel. The trick is to lean waaaay back before the camel starts to get up because the back end goes up first, thus potentially pitching you very far forward and making it harder for the camel to get its front half up because all your extra weight is leaning onto its front legs. I did not perfect this pose in time, making for an uncomfortably long pause when I was engaging every poorly toned core muscle I have while my camel was deciding whether it was actually inclined to go to the effort of hefting me and it into a standing position. It did work out in the end, and we had a few short circuits ‘round and ample opportunity for selfies with the camels. 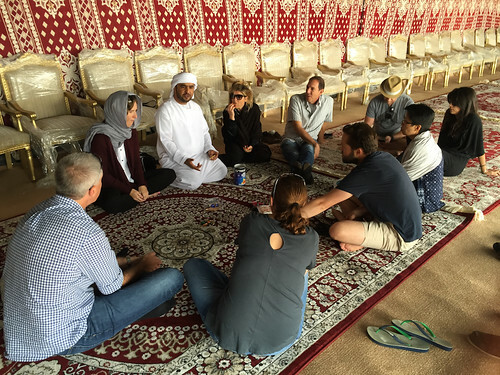 After camel riding and a very generous lunch, we further embraced the “just see what happens next” plan and piled back into the cars for what we thought was a trip out to the sand dunes. We did eventually make it out to the dunes, but not before we visited a few other highlights. Since Abdulla was in the other car, we in the Lost Boys vehicle didn’t get his running commentary on the local landmarks. 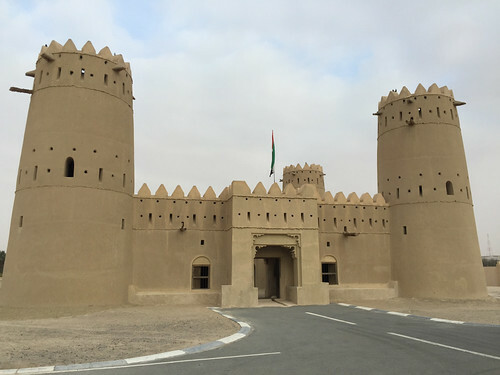 So when we pulled up at Liwa Castle we didn’t really know what it was or why we were there. We only knew it was very cool, completely deserted, and open all the way to the very tops of its towers. And here's Sara, Nick, me and Tom in our new album cover photo. After that pitstop, we took a few more turns and eventually got some text message commentary from the lead car, which gradually evolved into me putting them on speakerphone in our car so we could hear commentary on the Green Dune and the famous local roundabout (which tradition dictates we go around twice before proceeding). It was all a bit confusing, especially the part where we turned off towards a farm. And so we came to Abdulla’s family farm, which I guess is just another of Abdulla’s many interests. And what grows on Abdulla’s farm? Dates, of course! 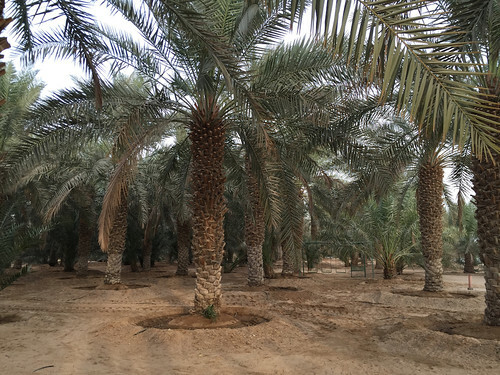 Interestingly, when asked how big the farm is Abdulla said “450". “450 acres?” No, not acres, or square feet or kilometres or anything like that. Of course he meant 450 Palm Trees. Which makes perfect sense. And what else is on Abdulla’s Farm? Goats! 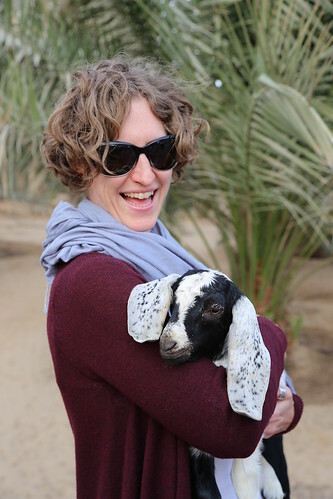 Raised for milk, meat, and baby goats which provide photo ops for visiting tourists. And still the day was not over! 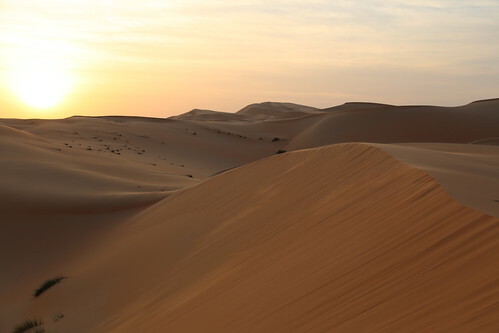 Smelling of camel, and goat, and not really sure of what to expect next, we finally made it to the chosen spot for a scamper through the sand dunes, just before sunset. This was really the desert - sand dunes as far as you could see. We all took off our shoes and ran through the sand and waited for sunset. It sounds funny, but it’s really remarkable how much sand there is. And then it was back to camp for dinner, which was undeniably impressive. It made me feel a little like the Whos down in Whoville and their roast beast. In fact, it was a sheep, complete with skull and baked brains. Did I try the roast sheep brains? Of course I did! How could you doubt it? They were mostly inoffensive and tasted like not chicken. 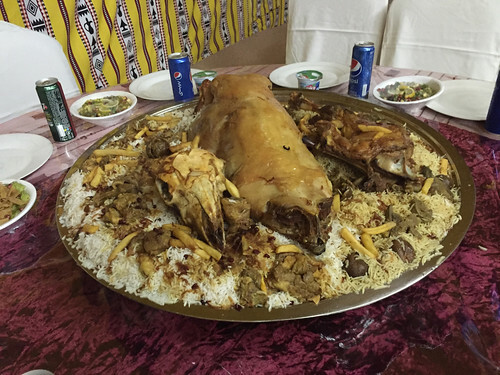 I also ate the entire meal using only my right hand, and with no utensils, Bedouin style! Of course Abdulla was particularly skilled in the one-handed eating, which seems to involve scooping up a handful of whatever you want and squeezing it into a sort of sausage in your hand which you then shove in your mouth. Not to be culturally insensitive or anything, but this seems like a kind of tricky system, especially when you eat a lot of long grain rice that doesn’t stick together. After dinner, we all sat around the fire in the dark and talked and stared into the flames and enjoyed each other’s company, as you do anywhere there’s a campfire. In another camp a little ways off we could hear music from a celebration of some kind. And one of the younger members of Abdulla’s gang made us sweet milky tea on the fire. Yes, he’s sitting in the fire pit. 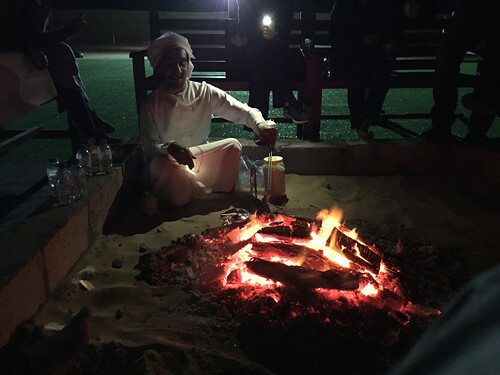 And yes, he’s making tea in the desert over an open fire by the light from his smartphone. Gradually, people drifted off to their tents for some rest. It had been a long day, and we were all at the end of a long and tiring job, and we had no idea what the next day would bring. However we only had to wait a few hours to find out. You, on the other hand, will have to wait until I find the energy to blog again and tell you about Day Two which was even more random and interesting than Day One. And while I may have started the post at the airport in Abu Dhabi, I'm finishing it on my little boat on the Grand Union Canal (Paddington Arm) on a grey and rainy Sunday morning. Because that's just how I roll.